KANSAS CITY, Mo.—“There are so many colors, so many brilliant colors. There are so many pastels. There are so many different things. There’s so much movement, so much grace, so much beauty, and intense, classic, incredible beauty. The spirituality is kind of the foundation of it all, and so it just takes it to the next creative level,” said Sally Rose, managing director of Jones Artistry, after seeing a performance by Shen Performing Arts. She saw the classical music and dance company at the Muriel Kauffman Theatre, part of the Kauffman Center for the Performing Arts, on the evening of March 29. In mentioning the digitally animated projected backdrops, she said their interaction with the performers “just really takes you in,” she said. “I had front row seats. 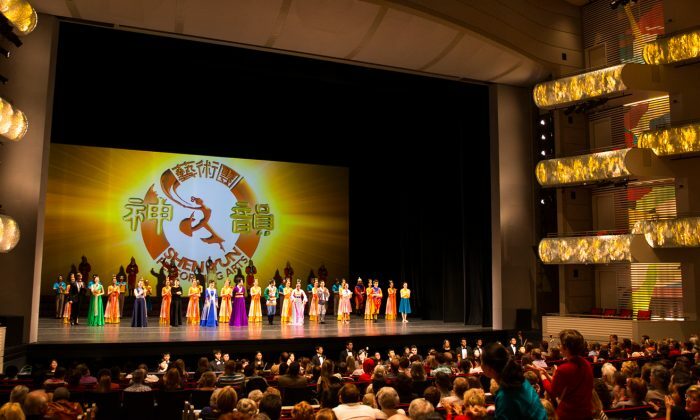 It wasn’t one step off,” she said, in noticing that Shen Yun dancers seem perfectly synchronized. “The percussion—with the dance integrating with the actual drum with the dance—really amazed me because it was just beat for beat for beat. But it was not just the movement of the dance it was also the percussion instrument. … It’s just amazing. Every single one was unique,” she said.